Become a conscious consumer. Know what’s in your food and what it will do for you. Through our recipes and messages, we always encourage you to fuel your body with fresh and organic foods and avoid the highly processed stuff. We ask that you consider ditching the microwave oven, tinfoil and plastic. Stay away from GMO, fast food, man-made fats and cheap proteins. Try eating a “REAL” whole food plant-based diet for a while with zero processed foods. Include soaked, sprouted and cultured foods to maximize the living nutrients and their digestibility. This is not as complicated as you might think. Keep it simple, focus on quality over quantity. In the beginning, this might sound a bit extreme and the change won’t happen overnight. Be patient. Take it one day at a time, one meal at a time. 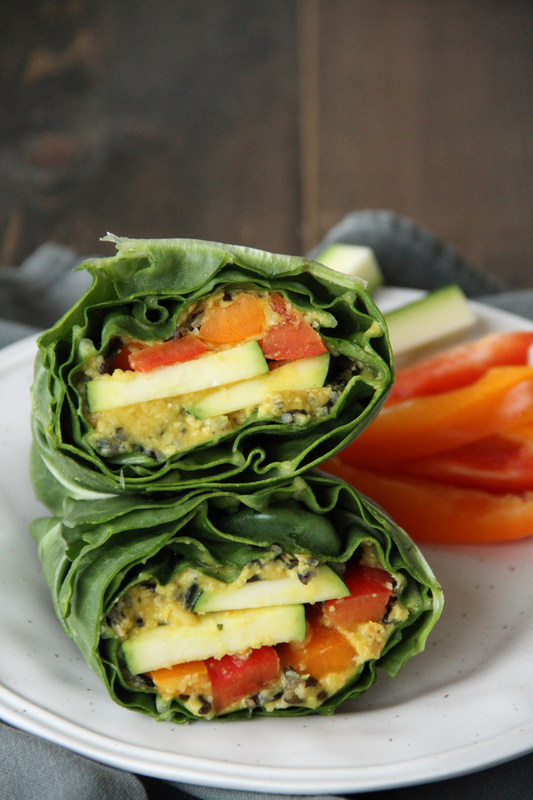 Today we are offering you a delicious recipe for green collard wraps. This easy to make meal will supply your body with wholesome nutrients and is a great option for post-workout fuel to speed up recovery and help increase athletic performance! The greens contained here are packed full of vitamins, minerals, antioxidants, and fibre. Wild rice contains significant amounts of protein, a nutrient which helps our bodies grow and build muscle and is also very alkaline-forming, unlike most grains which are acid-forming. This gives it a special anti-inflammatory feature, which contributes to overall health. The zinc found in the hummus will offer support for the immune system and promote muscle regeneration. A high protein meal is needed several hours post-workout, not directly after. Clean plant-based protein is present in foods such as quinoa, beans, lentils, algae, nuts and seeds. For your post-workout meal, include dark leafy greens for added vitamin and antioxidant support. Fuelling your body on a clean, plant-based diet is the key to forming strong muscles and supporting long-term health effects. 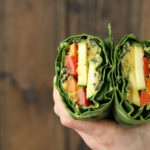 These Wild Rice & Hummus Collard Wraps are a great option for anyone who wants to eat healthy and especially beneficial for those of you who are active. They are easy to prepare, ready in the 20-minutes and can also be made well in advance. Pick two medium-sized leaves of collard greens and lay them down flat with the backside up. Trim the stem lightly to make it easier to roll. In a large pot bring water to a boil. Dip each leaf into the water and count to 10.Remove the leaf from water and pad it dry with a tea towel. Place both leaves with the backside up again and set aside. In a bowl mix wild rice and hummus together. In the middle of each leaf spread 1/2 of the wild hummus mixture, top with couple slices of zucchini and a handful of bell peppers. Wrap it up. 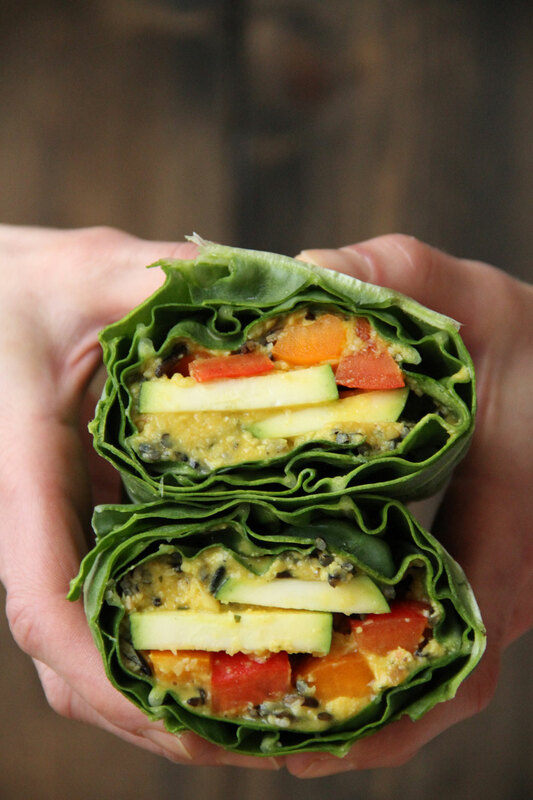 Using your hands gently fold the top and bottom parts of the leaves inward while you roll the wrap, right to left, (very much like wrapping a burrito). Cut in half. A serrated or very sharp knife works best. Enjoy! You can eat the collard greens raw, so you prefer it raw just skip the second step. Quick home-made hummus recipe can be found HERE. 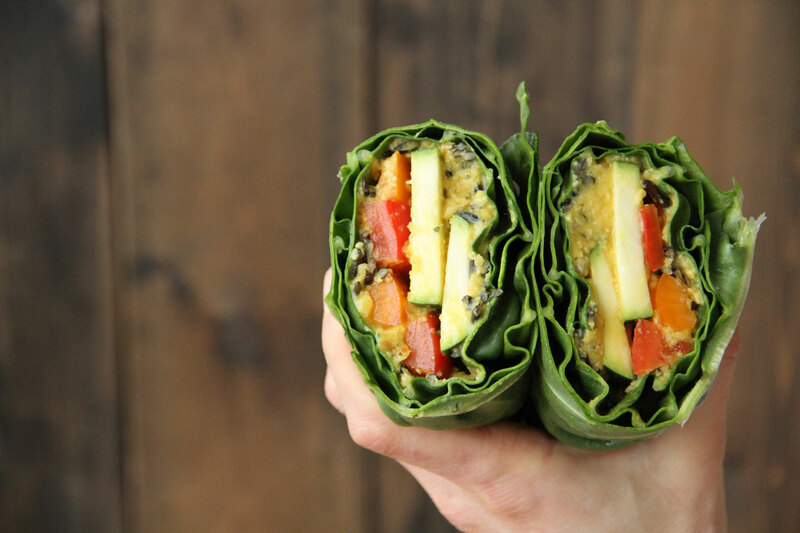 If you’re looking to optimize your plant-based post-workout meal ideas, be sure to check out our 22 Quick Plant-Based Pre and Post Workout Snacks recipes. If you try this recipe, let us know! Leave a comment, Pin for later, and don’t forget to tag a photo #avrecipes on Instagram. We would love to see your creations.